Science is all around us. Science is a part of who we are and what we do. 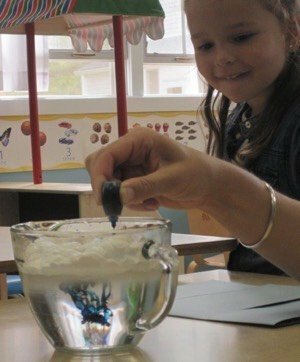 Young children have a natural curiosity for all things scientific and it is amazing to watch their minds grow and flourish during our experiments and scientific explorations. In addition to an introduction to Chemistry and Life Sciences, our little Science Explorers are also expanding their mind in other areas. According to the National Association for the Education of Young Children, Science strongly supports language and literacy as well. Children learn language through participation in meaningful, comprehensive language-based interactions. A science-based curriculum is rich in language use by both adults and children. Additionally, science demonstrations help children become comfortable in large group conversations. It is wonderful to be a first hand witness to their amazement when watching a chemical reaction for the first time. The children ask meaningful questions and interact with each other to discuss the experiment and develop substantial and well throughout conclusions. To hear the children still talking about the concepts learned with their families weeks later is remarkable. Discovering what clouds are made of and how it rains is fascinating. We talked about how the clouds are made of little microscopic droplets of water and when they get too heavy/full of water, it falls down as rain. We illustrated this with a simple demonstration using a cup, shaving cream, water and food coloring. We also discussed four different types of clouds, made a diagram poster as well as a cloud viewfinder to help us identify what type of clouds are in the sky. We explored how certain animals adapt to their surroundings by using camouflage. The children really took to this concept and loved the book about a lizard that changes his colors. 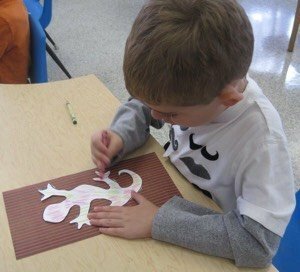 Then we placed a paper lizard on a background of brightly colored and patterned paper and used crayons to match the colors of the paper to the lizard to make it “disappear”! The children really enjoyed exploring this topic and could be heard talking about camouflage for weeks afterwards. 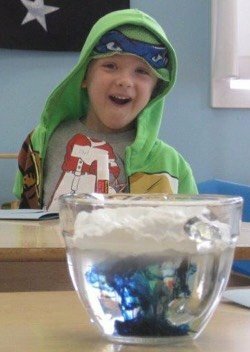 One of our favorite experiments in Science Explorers is when we explore chemical reactions with some simple items. We made “elephant toothpaste”, which is a mixture of hydrogen peroxide, yeast, warm water and a little dish soap. When combined in the right amounts, it makes an amazing chemical reaction that looks like foaming toothpaste. We also explored what happens when you mix baking soda and vinegar. We put baking soda on a tray and the children learned to use mini pipettes to mix the acid and the base for another spectacular chemical reaction! Another great preschool science class was our investigation into living and non-living things. We asked everyone think about what they need to live and grow. We concluded that all living things need food, water and air to live and grow. After reading a book about the subject, we used a chart to place pictures of living and non-living things in the correct category. Then the children were able to draw a picture of each of the categories in their own diagram. These are just a few ways we teach the children about science in our everyday lives.